The Construction Authority took an important step this week in the process to hire the Alignment design-build contractor. The official Request for Proposals was released to the four pre-qualified, short-listed teams. The RFP includes ninety-thousand pages of updated engineering and project information, including detailed drawings of every aspect of the 12.3-mile project. The four short-listed teams vying for the more than $700 million contract are (in alphabetical order): AECOM | Stacy and Witbeck JV; Herzog Rados Lane, a Joint Venture; Kiewit-Parsons, a Joint Venture; and San Gabriel Valley Transit Partners (STP), a Joint Venture of Fluor and Ames. The teams have until September 12, 2018 to submit proposals; after which, each will be reviewed by several committees of experts and ranked. A winning bidder will be selected later this year. Below, the W.A. 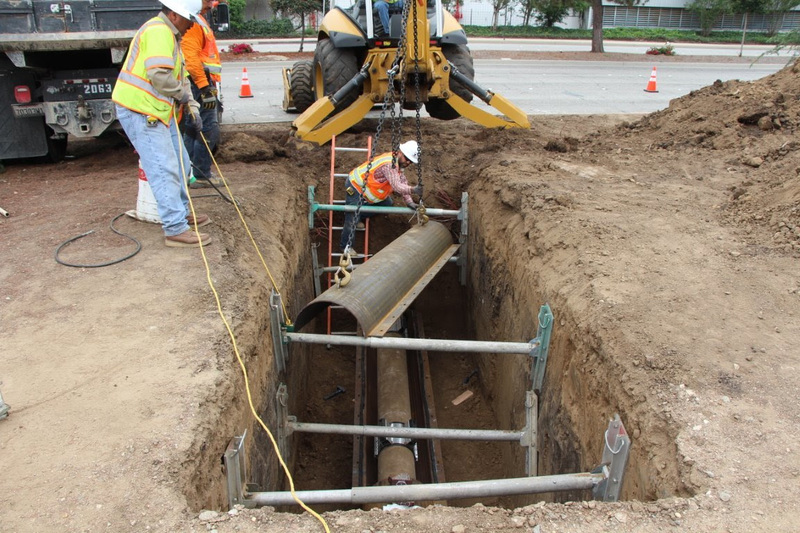 Rasic Construction team continues their work to relocate and protect utilities that cross the railroad right of way from Glendora to Montclair. Completing this work in advance of the Alignment design-build contract reduces risk for the future contractor. To date, Rasic crews have completed nearly half of the total work tasks, with the remaining utilities to be completed this year.